Posted 3/29/2019 8:32am by John Clarke & Karen Hurtubise. It’s spring at Qualla Berry Farm! Our ginger and turmeric seed rhizomes have arrived from Hawaii and fortunately Biker Dude and the folks at Puna Organics escaped damage from the Kilauea volcano last year, although many of their neighbors lost homes and roads. We are starting with presprouting the new seed rhizomes and tending our overwintered pots and crowns which will begin sprouting in April and May. 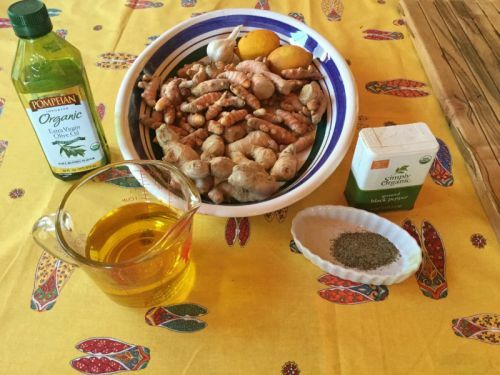 We invite you to come to our class and culinary experience in Growing and Using Turmeric and Ginger at Home on Sunday April 14th from 3:30-6:30 at Karen’s Young Harris office near the College at 155 Murphy Street. We will teach you the principles of organic growing with these tropical perennials in our temperate climate, and how to prepare your soil in containers or your garden and how to harvest and use turmeric and ginger in your kitchen over the season. We will show you some of the many varieties of ginger and turmeric and share what we know about the many health benefits of these super power plants that have been grown for centuries throughout the world. As a very special treat at the April 14 event we are collaborating with our good friend and Cooking Maven, Nanette Davidson, who will be preparing an amazing Indian cuisine meal featuring turmeric and ginger which we plan to serve to you around 5:30 at the conclusion of the “growing and using” workshop. Nanette will also provide recipes to participants! Nanette was Resident Artist for Cooking at John C Campbell Folk School and is the author of the recently published Folk School Cookbook. She blogs at https://www.brasstownpotluck.com. Nanette’s menu is included below. We will be asking about dietary restrictions when we get you registered. You will leave with a heap of ginger and turmeric knowledge (and a handout growing guide), plus a complimentary rhizome of ginger and turmeric to eat or grow a plant of each. This will be less of a hands on workshop but we will cover growing in beds and containers as well as potting, division, harvesting, temperature and watering. We will also have limited amounts of seed rhizomes and potted starts available for purchase at the end of the Young Harris workshops. Also, on Thursday April 18 from 6-8 PM we will do the same workshop at Young Harris without the supper. This will be a more hands on experience with soil prep, planting, propagation and division covered. 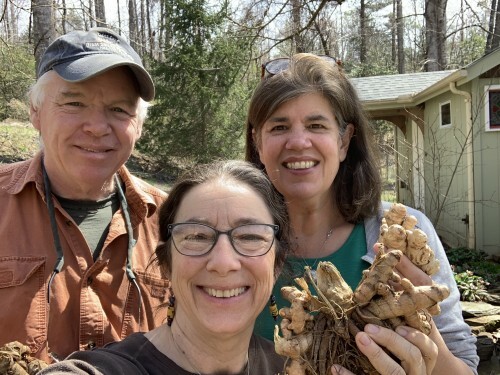 This class is most suitable for active gardeners and farmers primarily wanting to learn more in depth about growing ginger and turmeric. You will leave with a potted start of each and all the knowledge you need to begin to successfully grow your own. We will have teas, vinegars, spice paste, and honey turmeric ginger jam to sample. To register for the classes at Young Harris: Send an email to Karen Hurtubise and John Clarke at jkqualla@frontier.com and we will get back to you with a registration form. If you have questions call us at 828-389-3551. Cost is $89.00 for the April 14th date with Nanette’s Feast and $65 for the April 18th date, and includes all supplies and handouts. We have room for 20 people on April 14th and it’s first come, first serve for tickets. They are non-refundable so we can plan correctly for supplies. If something comes up for you, give or sell your ticket so it doesn’t go to waste. Menu for the April 14 event! 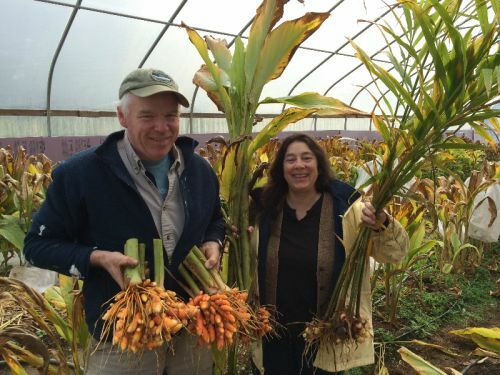 Looking forward to seeing y'all and starting our seventh growing season with Turmeric and Ginger!